HHS Agencies' Responsibilities Related to the NHII HHS Action Plan to Reduce Racial and Ethnic Health Disparities: Implementation Progress Report 2011-2014 Advisory Council April 2018 Meeting Presentation: How to Aid Dementia Quality Care National Plan to Address Alzheimer's Disease: 2015 Update EHR Payment Incentives for Providers Ineligible for Payment Incentives and Other Funding Study. Appendices. National Healthcare Quality and Disparities Reports—These congressionally mandated annual reports on health care quality and health disparities in the United States include a broad set of performance measures that will be used to monitor the nation’s progress toward improved health care quality. Each of these reports contains measures that specifically address diabetes care. More information is available at http://www.qualitymeasures.ahrq.gov. The National Quality Measures Clearinghouse™ (NQMC™),— Sponsored by HHS’s Agency for Healthcare Research and Quality (AHRQ), The National Quality Measures Clearinghouse (NQMC) is a database and Web site for information on specific evidencebased health care quality measures and measure sets. NQMC is sponsored by AHRQ to promote widespread access to quality measures by the health care community and other interested individuals. As of spring 2004, the NQMC contained 23 measures that address diabetes care. More information is available at http://www.ahrq.gov/qual/measurix.htm. Diabetes Care Quality Improvement: A Resource Guide for State Action— The Agency for Healthcare Research and Quality (AHRQ), in partnership with The Council of State Governments, produced the Diabetes Care Quality Improvement: A Resource Guide for State Action and its companion workbook, to help states assess the quality of diabetes care and develop quality improvement strategies. These tools provide an overview of the factors that affect quality of care for diabetes; present the core elements of health care quality improvement; assist state policymakers in using the data from AHRQ's 2003 National Healthcare Quality Report for planning state-level quality improvement activities; and, provide a variety of best practices and policy approaches that national organizations, the Federal Government, and states have implemented related to diabetes quality improvement. The Diabetes Care Quality Improvement: A Resource Guide for State Action is available online at http://www.ahrq.gov/qual/diabetes/. The companion workbook is available at http://www.ahrq.gov/qual/diabetes/workbk.htm. Printed copies may be ordered by calling 1-800-358-9295 or by sending an e-mail to ahrqpubs@ahrq.gov. The Community Guide to Preventive Services—The Task Force on Community Preventive Services is a 15-member nonfederal task force supported by the Centers for Disease Control and Prevention (CDC). CDC scientists review the effectiveness of health care interventions for the task force, which then makes recommendations to the public health community and health care delivery organizations. The recommendations generated by the task force are combined to form the Guide to Community Preventive Services, which includes a section on diabetes. To improve the health of people with diabetes, the task force reviewed the evidence of the effectiveness of diabetes disease and case management and self-management education. More information is available at http://www.thecommunityguide.org/diabetes/default.htm. Health Disparities Collaborative -Diabetes—The Health Resources and Services Administration, Bureau of Primary Health Care in collaboration with the Centers for Disease Control and Prevention, National Institutes of Health, and other partners, including the Institute for Healthcare Improvement are working to improve diabetes care within Federally Funded Health Centers. The purpose of the Health Disparities Collaborative–Diabetes is to improve diabetes care and performance measures through improved health care delivery systems, and to increase access and decrease health disparities among medically underserved populations. The learning from the Diabetes collaborative will be integrated with the Cardiovascular Collaborative for improved primary health care in Federally Funded Health Centers. Indian Health Service (IHS)—The Indian Health Service (IHS), National Diabetes Program (NDP) promotes collaborative strategies for the prevention of diabetes and its complications in the 12 IHS Service Areas through coordination of a network of 19 Model Diabetes Programs and 13 Area Diabetes Consultants. The NDP also manages the Special Diabetes Program for Indians grant program with 332 grantees in 35 states. In addition, the IHS has developed standards of care that are routinely updated to help provide consistent, quality care to patients with diabetes. More information is available at http://www.ihs.gov/MedicalPrograms/Diabetes/. Healthy People 2010 (HP2010)—Healthy People 2010 is a set of disease prevention and health promotion objectives for the nation to achieve by 2010. 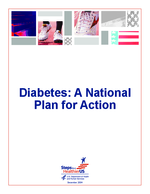 It includes 17 objectives specifically aimed at reducing the disease and economic burden of diabetes and improving the quality of life for all persons who have or are at risk for diabetes. In addition, Centers for Disease Control and Prevention, Division of Diabetes Translation’s National Objectives include measures for tracking the quality of diabetes care received. For example, these programs assess the number of foot exams, eye exams, and annual HbA1c tests conducted. The Centers for Medicare & Medicaid Services (CMS)—The Centers for Medicare & Medicaid Services (CMS) provides benefits to Medicare beneficiaries for diabetes selfmanagement training, medical nutrition therapy, prescription drugs, and select testing equipment for persons with diabetes. In addition, CMS sponsors the National Diabetes Eye Exam Program that matches Medicare beneficiaries aged 65 and older who have diabetes and have not had a medical eye exam in the past 3 years with a volunteer ophthalmologist in their area to receive a free comprehensive eye exam and up to 1 year of follow-up care for any condition diagnosed at the initial exam. For more information about Medicare coverage of diabetes services, go to http://www.cms.hhs.gov. The National Institute of Diabetes and Digestive and Kidney Diseases (NIDDK)—This Institute of the National Institutes of Health supports basic and clinical research at universities and medical centers throughout the U.S. and at research facilities in Bethesda, Maryland and Phoenix, Arizona. NIDDK research forms the scientific foundation for improvements in diabetes care and for messages delivered via the National Diabetes Education Program. Examples of NIDDK-supported research include the Diabetes Control and Complications Trial and the Diabetes Prevention Program (previously discussed). There are many other ongoing diabetes research efforts. One important effort is Trial Net, an international network of investigators, clinical centers, and core support facilities whose aim is to recruit patients and support studies that will result in an improved understanding of type 1 diabetes disease development and conduct prevention trials (http://www.diabetestrialnet.org). Another is TEDDY (The Environmental Determinants of Diabetes in the Young), which is developing and carrying out research to identify environmental causes of type 1 diabetes in genetically susceptible individuals (http://www.teddystudy.org/). A third is STOPP-T2D (Studies to Treat or Prevent Pediatric Type 2 Diabetes), which is conducting pilot studies for a school-based trial directed at preventing the risk factors for type 2 diabetes in middle school children, and a multicenter clinical trial of optimal treatment for adolescents with type 2 diabetes (http://www.todaystudy.org/). For more information on type 1 and type 2 diabetes research, please visit http://diabetes.niddk.nih.gov/. The Diabetes Control and Complications Trial (DCCT)— provided evidence that improving control of blood glucose levels delays the onset and progression of eye, kidney, and nerve diseases caused by diabetes. An ongoing epidemiologic follow-up study of this population, Epidemiology of Diabetes Interventions and Complications (EDIC) study, has shown that the effectiveness of a limited period of intensive glycemic control on reducing complications persist 20 years after the study began and become even stronger over time. More information is available at http://diabetes.niddk.nih.gov/dm/pubs/control/index.htm. National Diabetes Education Program (NDEP)—Helping the Student with Diabetes Succeed: A Guide for School Personnel—This comprehensive guide is designed to empower school personnel, parents, and students to create a safe learning environment and provide equal access to educational opportunities for all children with diabetes. More information is available at http://www.ndep.nih.gov/resources/school.htm. Extraordinary Opportunities in Diabetes Research—rapidly expanding, crosscutting areas in which increased investment or development of new mechanisms will significantly speed research in areas such as genetics of diabetes, autoimmunity and the beta cell, and obesity. Special Needs for Special Problems—research targeted to specific populations, complications, and methodological approaches. Resource and Infrastructure Needs—expanding research infrastructure (e.g., trained professionals and technology). National Kidney Disease Education Program (NKDEP)—The National Kidney Disease Education Program, sponsored by the National Institute of Diabetes and Digestive and Kidney Diseases, aims to raise awareness of the seriousness of kidney disease, the importance of testing those at high risk, and the availability of treatment to prevent or slow kidney failure. The NKDEP is designed to close the gap between evidence and practice by educating people at risk and physicians, with the goal of identifying kidney disease in its early, treatable stages. More information on the NKDEP can be found at http://www.nkdep.nih.gov. National High Blood Pressure Education Program (NHBPEP)—This goal of this program, which is coordinated by the National Heart, Lung, and Blood Institute of the National Institutes of Health, is to reduce death and disability related to high blood ressure through programs of professional, patient, and public education. The NHBPEP is a cooperative effort among professional and voluntary health agencies, state health departments, and many community groups. More information is available at http://www.nhlbi.nih.gov/about/nhbpep. National Cholesterol Education Program (NCEP)—The goal of the National Cholesterol Education Program is to contribute to reducing illness and death from heart disease in the U.S. by reducing the percent of Americans with high blood cholesterol. The NCEP directs educational efforts targeted at both health professionals and the public. The program aims to raise awareness and understanding about high blood cholesterol as a risk factor for heart disease and the benefits of lowering cholesterol levels as a means of preventing heart disease. More information about this program, which is coordinated by the National Heart, Lung, and Blood Institute of the National Institutes of Health, can be found at http://www.nhlbi.nih.gov/about/ncep/. National Eye Health Education Program (NEHEP)—The focus of the National Health Education Program is on public and professional education programs that encourage early detection and timely treatment of diabetic eye disease and glaucoma and the appropriate treatment for low vision. This program is coordinated by the National Eye Institute of the National Institutes of Health in partnership with a variety of public and private organizations. More information can be found at http://www.nei.nih.gov/nehep/. Family Center Support Project—The Centers for Disease Control and Prevention, Division of Diabetes Translation has undertaken a 5-year behavioral research project that will identify and examine nontraditional psychosocial factors regarding diabetes education and the family. These factors include community characteristics, health care reimbursement, family processes, diabetes education, provider-patient characteristics, acculturation or westernization, as well as psychological factors. Previously unrecognized factors include racism, living arrangements, perceptions of safety, and intergenerational coping skills, and their overall impact on psychological well being. More information is available at http://www.cdc.gov/diabetes/projects/family.htm. Translating Research Into Action for Diabetes (TRIAD)—Translating Research Into Action for Diabetes is a 5-year, six-center prospective study of managed care and diabetes quality of care, costs, and outcomes in the United States. In its third year, this important study is the first and largest multicenter study of diabetes quality of care, quality of life, and factors affecting them. TRIAD is currently developing plans to carry out a detailed assessment of socioeconomic status and how it relates to quality of care and health status with diabetes. Sponsored by Centers for Disease Control and Prevention and National Institute of Diabetes and Digestive and Kidney Diseases, TRIAD’s overall goal is to examine the influence of managed care structure on processes and outcomes of diabetes care. More information is available at http://www.triadstudy.org/. National Diabetes Laboratory—Since 1997, the Centers for Disease Control and Prevention (CDC) has dedicated $3 million annually to a National Diabetes Laboratory (NDL) to support emerging scientific efforts to help prevent and treat type 1 diabetes. CDC, National Center for Chronic Disease Prevention and Health Promotion, Division of Diabetes Translation, and the National Center for Environmental Health are collaborators on this project. For example, scientists are working to develop and evaluate laboratory technology for improving the measurement of genetic risk factors for type 1 diabetes and its complications, to study autoantibodies of type 1 diabetes, and to develop other projects that will improve the lives of people with type 1 diabetes. For more information, call toll-free 1-877-CDC-DIAB, e-mail diabetes@cdc.gov, or visit CDC’s National Center for Environmental Health’s National Diabetes Laboratory at http://www.cdc.gov/nceh/dls/diabetes.htm. Take Time to Care About Diabetes—This campaign developed by the Food and Drug Administration, Office of Women’s Health is intended to raise women’s awareness of the seriousness of diabetes and the importance of taking steps to treat the disease to avoid heart and kidney problems, blindness, stroke, or amputation of a lower limb. More information is available at http://www.fda.gov/womens/taketimetocare/diabetes/default.htm.